George Rodrigue observed about sixty miles west of Amarillo. 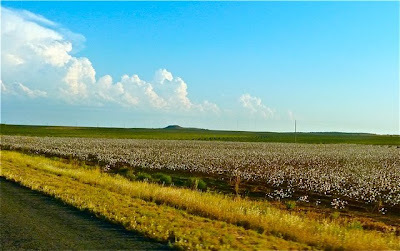 We’re crossing Texas again, the return trip of a journey begun in June. 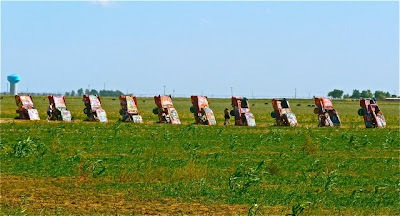 Unlike the drive west through Houston and Fort Stockton, we’re traveling the northern route, passing some of our favorite sites including Graffiti (1974), ten buried cadillacs just outside of Amarillo, an art installation wedged (with room to spare) between cotton fields and cattle feedlots. This is the gateway to my favorite stretch of American road, three hundred and forty miles on Hwy 287 between Amarillo and Fort Worth. 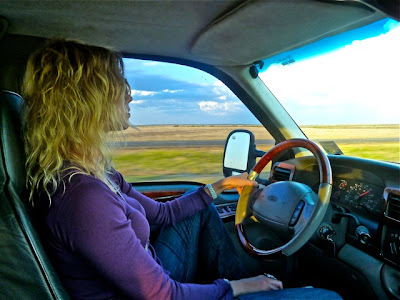 I take the wheel here, wanting the responsibility of rolling slowly through near-deserted West Texas towns. It was late afternoon, and we made the mistake of trading Willy’s Place for the Saints Radio Network. * Following the game, we drove in silence. “What are you thinking about?” I asked George. Responsible for photographs, George indulged not only his visual passions but also mine, especially when it came to grain silos. 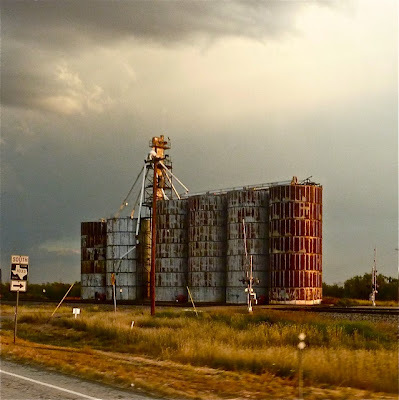 Unlike the stark Bernd and Hilla Becher images that first alerted me to the large metal structures, his images include the sky and surroundings, the sun and shadows, the pervasive bigness of Texas. 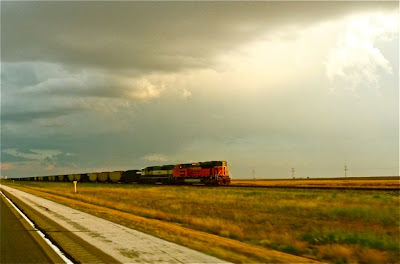 He rolled down the window and, although the sun still shined, we smelled the rain awaiting us near Shreveport, a warm, almost attic-type musty scent (foreign to central California) that reminds us of home. 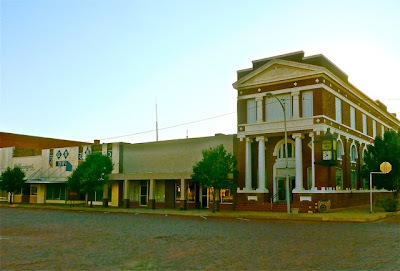 We remembered the restaurant in Lafayette, Louisiana that burned more than ten years ago. Some of my favorite road memories are my 3am departures from San Antonio to Oklahoma City. I loved to watch the shapes arrive on the horizon of the slowly revealed landscape as the sun came up. Yes she might be speeding but there are some parts of TX where Limit is 80. So there, I'm taking up for the girl. OK so if you are in TX come by Corpus Christi on your way back to Cajun Country!! Oh Gary, Tim was teasing me! And neither of you should worry, by the way, as the speed limit was 70 - just as it shows in the photo. And unfortunately we'll miss Corpus, as we arrived in New Orleans late last night. Maybe next time! The photos in this post are spectacular. George composed them like paintings complete with fabulous clouds. 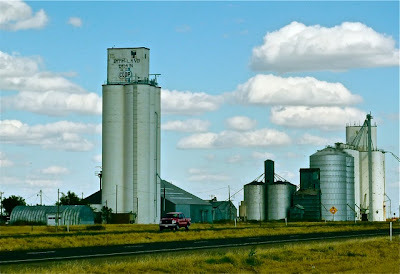 My favorite is the group of rusty silos with the Texas highway sign in front and that looming sky overhead. The one with the red locomotive is also wonderful. Thanks to you and to George! 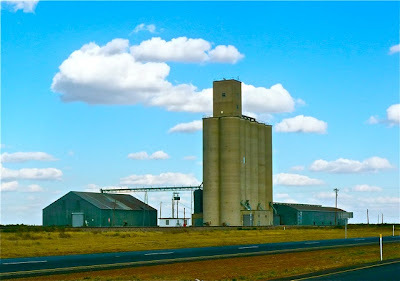 At last, someone who appreciates the silos! Thank you Nancy! 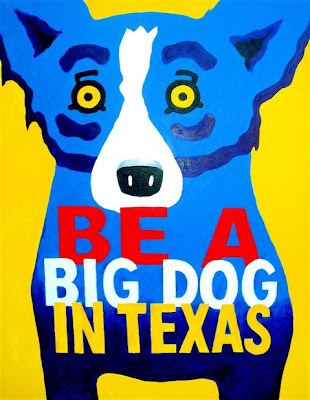 My mom and I plan to attend the opening of "Blue Dogs in Texas" next month in Amarillo. Will George be available for autographs anytime during this event? I have the print "We Blues Dem Away," and I'd love to have it autographed if possible. Just thought I'd check since bringing the print from Austin to Amarillo would be a little bit of a job! Sounds good...thanks for letting me know Wendy! I knew I should probably check before dragging my print along on the trip :) They are rather large, and I can see how it could be an issue in a crowd of people, makes total sense to me! We are looking forward to it...and we'll check back here to see the list of events.